Sozvezdiya.ru - Astronomy Encyclopedia. J.
Jacobus Kapteyn Telescope (JKT) Smallest of the three Anglo-Dutch telescopes of the ISAAC NEWTON GROUP on La Palma. The JKT has a 1.00-m (39-in.) diameter mirror and is used exclusively for astronomical imaging. It was installed at the ROQUEDELOS MUCHACHOS OBSERVATORY in 1985. James Clerk Maxwell Telescope (JCMT) World's largest radio telescope capable of working at submillime-tre wavelengths (0.3-2 mm), operated by the JOINT ASTRONOMY CENTRE. The JCMT is situated at MAUNA KEA OBSERVATORY in Hawaii, where it is above 97% percent of the water vapour in the atmosphere - an essential requirement for this waveband. The primary mirror, 15 m (49 ft) across, consists of 276 individually adjustable aluminium panels. An opening enclosure protects the instrument. Since its inauguration in 1987, the JCMT has undertaken pioneering work at submillimetre wavelengths, including the first observations made with an imaging bolometer array. Jansky, Karl Guthe (1905-50) American radio engineer, whose detection of radio waves from the Milky Way marked the beginning of RADIO ASTRONOMY. In 1928 Jansky joined the Bell Telephone Laboratories in Holmdel, New Jersey, after graduating from the University of Wisconsin. He made his historic discovery with a rotating antenna that received both very short radio waves (20.5 MHz) and much longer waves (45 kHz), which he was using to search for the cause of static that interfered with ship-to-shore and other kinds of telecommunications. He identified three kinds of static. The first two were associated with thunderstorms: localized storms, and more distant storms whose radio noise was reflected by the ionosphere. The third kind, a steady hiss, was initially a mystery, but Jansky noticed that it reached a maximum intensity every 23h 56m, the SIDEREAL PERIOD. Jansky noted that during the solar eclipse on 1932 August 31, the intensity of the waves did not decrease, as it would have done if the radio emission came from the Sun. Also, the hiss was strongest along the galactic plane, especially at a right ascension of around 18h, in Sagittarius - the likely centre of the MILKY WAY already identified by Harlow SHAPLEY and Jan OORT. Janksy concluded that giant ionized clouds of INTERSTELLAR MATTER in the Milky Way were producing the static, marking the birth of the new science of radio astronomy. Although this made the front page of the New York Times, there was little interest from the scientific community. Jansky himself failed to see the potential of his discovery. It was taken up, initially single-handedly, by Grote REBER, and only after World WarII did radio astronomy really take off. To honour Jan-sky, the IAU in 1973 adopted his name for the unit of flux density of extraterrestrial radio emissions. jansky (symbol Jy) Unit of FLUX DENSITY adopted by the International Astronomical Union in 1973 in honour of Karl JANSKY. One jansky is equal to 10 ~26 watts per square metre per hertz. Janssen, (Pierre) Jules (Cesar) (1824-1907) French astronomer who invented the spectrohelioscope and, independently of Norman LOCKYER, discovered the spectral line of helium in the solar chromosphere. Originally a businessman, he turned to solar astronomy after hearing of the spectroscopic discoveries of Gustav KIRCHHOFF. Janssen built an observatory in 1862 atop his house at Montmartre to investigate the dark bands in the Sun's spectrum. Using a five-prism spectroscope, Janssen was able to resolve the bands into fine lines that were most intense during sunrise and sunset, when the Sun was observed through the thickest layers of the Earth's atmosphere, and identified water vapour in the atmosphere as the source of these TELLURIC LINES. On an expedition to India, Janssen used a spectroscope to study solar prominences visible during the 1868 August total eclipse, demonstrating that the bright lines in their spectra indicated a gaseous nature. He re-examined these lines by constructing a spectrohelioscope, with which the prominences could be observed spectro-scopically without waiting for a total eclipse. Janssen observed three bright yellow lines in their spectra, two of which were already identified with the element sodium; the third, previously undiscovered, was attributed by Lockyer to a new chemical element, called helium, not discovered on Earth until 1895. Two years later, during the Franco-Prussian War, Janssen escaped the besieged city of Paris in a balloon, intending to observe the1870 December total solar eclipse in Algeria. During the 1874 and 1882 transits of Venus, he obtained multiple images of the planet in rapid succession using a technique that was a forerunner of cinematography. His collection of more than six thousand superb solar photographs taken between 1876 and 1903 was published as Atlas du photographies solaires (1904). Janssen helped to establish the MEUDON OBSERVATORY (1875) and another at Mont Blanc (1893-95), which was later known as the PIC DU MIDI OBSERVATORY. Jeans, James Hopwood (1877-1946) English theoretical physicist who developed advanced mathematical models to attack many fundamental astrophysical problems. Jeans' first major theoretical work, published while he was at Trinity College, Cambridge, used statistical mechanics to explain the behaviour of gas molecules. Since many astrophysical objects, including stars and nebulae, are largely composed of gas, this kinetic theory of gases became widely used by astronomers investigating the structure of stellar interiors and the interstellar medium. A report written by Jeans in 1914 helped the QUANTUM THEORY to become accepted. He then began a long study of rotating fluid masses, building on previous work by, among others, George Howard Darwin (1845-1912) and Edouard ROCHE. This led him to reject the NEBULAR HYPOTHESIS of Pierre Simon de LAPLACE by showing that the rotating pear-shaped mass required by this theory was dynamically unstable. Jeans proposed instead that the Solar System formed after another star passed close by our Sun and violently removed some of its matter, which subsequently coalesced into the planets. This tidal theory was later extended by Harold JEFFREYS. In 1928 Jeans proposed CONTINUOUS CREATION, a concept that laid the foundations for the STEADY-STATE THEORY of cosmology, though it was left to others, including Fred HOYLE, fully to develop that model. Jeans concluded his life in astronomy by writing popular books, including The Universe Around Us (1929), The Mysterious Universe (1930) and Through Space and Time (1934), and radio broadcasts aimed at a general audience. Jeffreys, Harold (1891-1989) British physicist who developed models for the structure and evolution of the Earth and the Solar System. His work in hydrodynamics and geophysics led him to extend James JEANS' tidal hypothesis for the origin of the Solar System. This theory suggests that the passage of stars close to the Solar System triggers the formation of planets. Jeffreys also proposed models of the circulation of Earth's atmosphere and the atmospheres of the outer planets. Jet Propulsion Laboratory (JPL) Federally funded research and development facility managed by the California Institute of Technology (Caltech) for the NATIONAL AERONAUTICS AND SPACE ADMINISTRATION (NASA). It owes its origin (and its name) to rocket experiments carried out by Theodor VON KARMAN in the 1930s in a canyon near Pasadena, California. Spurred by the onset of World War II, the laboratory conducted missile experiments on the site and it grew rapidly, eventually flying the first successful US spacecraft, EXPLORER 1, in January 1958. When NASA was created the following December, JPL was transferred to the new space agency from US Army control, bringing expertise in building and flying spacecraft, propulsion systems, guidance, systems integration and space telecommunications. JPL is NASA's centre of excellence for deep-space systems, and its broad remit covers most aspects of unmanned US space missions. It has been responsible for the high-profile planetary probes of the past few decades, and continues this role with such future projects as deep impact and EUROPA ORBITER. It also plays a major role in space observatories such as the HUBBLE SPACE TELESCOPE and the SPACE INFRARED TELESCOPE FACILITY, as well as Earth science satellites such as Terra, CloudSat and GRACE (the Gravity Recovery And Climate Experiment). jets Long, thin gaseous structures characterized by radio emission and/or optical nebulosity. There are always two jets, but one may be hidden by the central object or disrupted by the medium through which it travels. Jets are usually collimated (kept straight) and confined by strong magnetic fields or winds, and the rotation of the central object plays a significant role. Jets arise from two vastly different situations. In highly luminous RADIO GALAXIES (double-lobed radio sources) and QUASARS, two jets of highly supersonic, energetic electrons bore into the ambient intergalactic medium. The jets remain collimated unless the surrounding gas causes wiggles and bends by refraction, or until they impact upon sufficiently dense material so that they dissipate much of their energy in shocks, creating radio 'hot spots' of SYNCHROTRON RADIATION within the large radio LOBES. Sometimes galaxies even generate knots along their jets that can be seen as optical nebulae. The jet of M87 is 8000 l.y. long, and the Hubble Space Telescope is able to image knots and features as small as 10 l.y. across in the jet. The jets connect the radio lobes to the centre of the galaxy, and they are thought to be powered by a BLACK HOLE at its centre. The central engine is able to pump the jets in the same two directions for periods of order 100 million years. At times the velocity of the material in the jets of M87, and from several quasars, appears to be greater than the speed of light. This SUPERLUMINAL motion is actually a geometric effect, and it requires the jet to be pointing almost directly at Earth (within 10°). This may mean that more objects have jets than expected, but they are not see because they are not pointing towards Earth. Jodrell Bank The 76-m (250-ft) dish of the Lovell Radio Telescope at Jodrell Bank. Built in 1957, this is the world's second-largest fully steerable radio telescope. A second generator of jets is a low-luminosity PROTO-STAR. The material around the fledgling protostar collapses on to the star, helping to initiate the nuclear fusion reaction that turns hydrogen into helium. This reaction reverses the infall, and eventually an outflow occurs. The wind is millions of times stronger than the SOLAR WIND, and is usually supersonic, so that shock waves are produced in the interstellar medium where the jet impacts. The shocked clumps of material are called HERBIG—HARO OBJECTS; they can be as small as the size of the Solar System, and the mass of the Earth. The clumps have been found to be variable: they can be seen to move and change over several years. The protostar itself is invisible, hidden behind a thick cocoon of dust and probably with a large dust disk, but it is assumed that the jets leave the system along the rotational axis of the star. The material in the jets can be detected in the optical, infrared and radio regions, with the radio observations highlighting the presence of magnetic fields. jet stream Narrow belt of high-speed wind in a planetary ATMOSPHERE. On Earth, the jet streams that have the greatest influence on the surface weather, including the development, motion and decay of depressions, are two westerly jets, the subtropical and polar jet streams, in each hemisphere. These typically occur as discontinuous segments around the Earth, thousands of kilometres long, hundreds of kilometres wide, and a few kilometres deep. They lie in the upper TROPOSPHERE and lower STRATOSPHERE, often being located where there is a break in the TROPOPAUSE. Seasonal jets, such as the easterly equatorial and the westerly polar-night jet streams, also occur within the stratosphere. On Earth, jet stream wind speeds generally lie in the range 160—320 km/h (100—200 mph), with a recorded extreme of 656 km/h (408 mph). 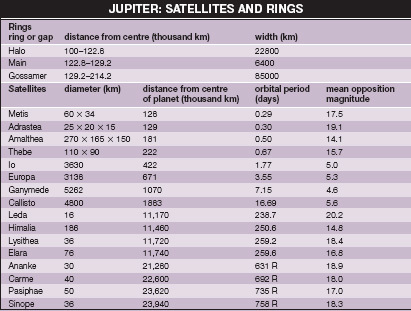 Far higher speeds, sometimes in excess of 1400 km/h (870 mph), have been observed on Jupiter, Saturn and Neptune. Jewel Box Name given to the KAPPA CRUCIS CLUSTER by John HERSCHEL. Jodrell Bank Observatory Major radio astronomy facility of the University of Manchester and the location of Britain's most famous scientific instrument, the Lovell Telescope. The Jodrell Bank site, 32 km (20 mi) south of Manchester, was selected by Bernard LOVELL in 1945 as a suitable location from which to observe cosmic rays. He used ex-army radar equipment to try to detect the rays, but instead found reflections from meteors. Building on this experience, he constructed a 66-m (218-ft) fixed parabolic aerial in 1947 and, in 1957, the fully steerable 76-m (250-ft) dish known originally as the Mark I telescope that now bears his name. Both telescopes were the largest of their kind in the world when built, and the 250-ft telescope immediately became famous through its tracking of SPUTNIK 1. Outstanding debts on the telescope were eventually cleared by the Nuffield Foundation, and what had been called the Jodrell Bank Experimental Station became the Nuffield Radio Astronomy Laboratories. A second fully steerable radio telescope, the 26-m (85-ft) Mark II, was completed in 1964 and, together with a third telescope at Nantwich, began pioneering work on long-baseline interferometry. The Multi-Telescope Radio-Linked Interferometer project of 1976 extended this work to several other sites with telescopes operated by Jodrell Bank. In the early 1990s, this array (now renamed MERLIN) was extended to include a new 32-m (105-ft) telescope at Cambridge. In the meantime, the Mark I had been upgraded and renamed the Lovell Telescope on its 30th anniversary. Further upgrades to the Lovell in 2000—2002 ensure that the telescope will continue to play a leading role in astronomy both as a single-dish instrument and as part of MERLIN. Its state-of-the-art receivers make it 30 times more sensitive than when it was first built. Johnson, Harold Lester (1921-80) American astronomer who co-invented the UBV PHOTOMETRY system used to analyse the physical properties of stars and galaxies. Johnson was an electronics expert who designed and built many kinds of photometer. He improved the sensitivity of the detectors used in these instruments and found innovative ways of reducing the 'noise' that interfered with photometric observations. Johnson also designed and built a prototype of the first multiple mirror telescope, installed in the 1970s at the Mexican National Observatory. Working with William W. MORGAN in the early 1950s, he developed the UBV SYSTEM for measuring stellar magnitudes in three basic colours or wavebands: U (ultraviolet), B (blue) and V (visual, or yellow). Later, Johnson extended the system to include the R (red) and I (near-infrared) bands, then to additional bands out to 4 um, known as J, K and L. Johnson and his colleagues measured thousands of 'reference stars' with the UBV and UBVRI photometry systems, and they were able to calibrate the spectral energy distributions ('absolute energy curves'), resulting in more accurate stellar temperature scale. Using his new system of photometry, Johnson evolved powerful tools for analysing stars and clusters of stars by plotting their apparent visual magnitudes against B-V differences or 'indices' (colour-magnitude diagram) or U-B index versus B-V index (colour-colour diagram). He was able to estimate the ages of clusters from their colour-magnitude diagrams. The same principles were applied to studies of individual stars, and using these tools Johnson made many investigations involving carbon stars, subdwarfs, Cepheids and M stars, as well as structures like circumstellar shells. Johnson Space Center (JSC) In full, the Lyndon B. Johnson Space Center, the NATIONAL AERONAUTICS AND SPACE ADMINISTRATION (NASA) operational headquarters for all US manned space missions, and home to NASA's Astronaut Corps. The JSC lies about 40 km (25 mi) south-east of Houston, Texas. It was founded in 1961 as the Manned Spaceflight Center, but its name was changed in 1973 February to honour the former US President. The JSC's remit also includes spacecraft design, development and testing; the selection and training of astronauts; mission planning; and participation in the various experiments conducted in space. Its facilities include the Neutral Buoyancy Laboratory, a giant pool that can accommodate full-size mock-ups of the INTERNATIONAL SPACE STATION and allow astronauts to gain experience working in a weightless environment. Joint Astronomy Centre (JAC) Organization based in Hilo, Hawaii, that operates the JAMES CLERK MAXWELL TELESCOPE and the UNITED KINGDOM INFRARED TELESCOPE on behalf of the three partner countries (the UK, Canada and the Netherlands). Joint Institute for Laboratory Astrophysics (JILA) Interdisciplinary institute for research and graduate education in the physical sciences, operated jointly by the University of Colorado (CU) and the National Institute of Standards and Technology (NIST). Founded in 1962, it is located on the main CU campus in Boulder, Colorado. JILA's research areas include atomic and molecular interactions, new states of matter, cooling and trapping of matter and nanotechnology. Its laboratories host 'the coldest place in the Universe'. Jones, Harold Spencer (1890-1960) English astronomer, the tenth ASTRONOMER ROYAL, who arranged the move of GREENWICH OBSERVATORY to Herstmonceux, and improved the value of the SOLAR PARALLAX. From 1923 to 1933 Jones served as His Majesty's Astronomer at the Cape, South Africa. There he supervised studies of lunar occultations, using data accumulated between 1880 and 1922 to verify and correct the lunar constants calculated by E.W. BROWN. He also measured the parallaxes, and hence distances, to hundreds of stars in the Milky Way. In 1933 Jones returned to England to become Astronomer Royal, retiring in 1955. Jones' major lifetime project was a highly detailed analysis of tiny variations in the Earth's rotation rate. He is most famous for his refinement of the solar parallax, and hence of the ASTRONOMICAL UNIT. In 1928 the IAU appointed him president of a commission to determine the solar parallax from observations to be made of the asteroid (433) Eros, which would be at opposition in 1931. Using thousands of visual and photographic observations from some fifty observatories in both hemispheres, Jones began a ten-year process of reduction and calculation that ranks as one of the most impressive calcu-lational feats of the pre-computer era. The result, announced in 1941, was 8".790, corresponding to a value for the AU of 149,670,000 km. Jovian Pertaining to the planet Jupiter. The term Jovian planet is also used to describe the Solar System's giant planets or gas giants: Jupiter, Saturn, Uranus and Neptune. The atmospheres of the Jovian planets represent a significant proportion of their total mass, in contrast to those of the inner, terrestrial planets. Joy, Alfred Harrison (1882-1973) American astronomer who used spectroscopy to study variable stars and novae, and to find stellar distances and radial motions. He spent almost 60 years at the MOUNT WILSON OBSERVATORY, which he joined in 1915, working under George Ellery HALE. He used the technique of spectroscopic parallax developed by Walter S. ADAMS to calculate the distances to stars. Joy measured the radial velocities for thousands of stars, including many Cepheid variables, which allowed him to determine the distance of the Solar System to the centre of the Milky Way. He also was the first to classify the T Tauri stars. Julian calendar CALENDAR devised by Julius Caesar and the Greek astronomer Sosigenes of Alexandria in 45 BC. The system was based on a year of 365.25 days, fixed at 365 with a leap year of 366 days every four years to compensate. The year commenced on March 25. The calendar, which was completed by Caesar Augustus in 44 BC and adopted throughout the Roman Empire, established the present-day names, lengths and order of the months. The Julian calendar was in general use in the West until 1582, by which time the approximation to the true solar year of 365.24219 days had accumulated an error of ten days. It was superseded by the GREGORIAN CALENDAR but was still used in the UK until 1752. Julian date Number of days that have passed since noon GMT on 4713 BC January 1 (the JULIAN DAY number), plus the decimal fraction of a mean solar day that has elapsed since the preceding noon. For example, the Julian date at 18.00 UTC on 2000 January 1 was 2,451,545.25. The modified Julian date (MJD) is a shortened form, using only the last five digits of the full Julian date and commencing at 0h UTC on 1858 November 17. The modified Julian date at 18.00 UTC on January 1 therefore was 51544.75, the 0.5 difference being because the Julian date changes at noon but the MJD at midnight UTC. Juliet One of the small inner satellites of URANUS, discovered in 1986 by the VOYAGER 2 imaging team. 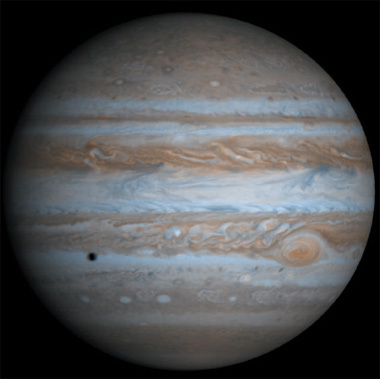 Juliet is about 84 km (52 mi) in size. It takes 0.493 days to circuit the planet, at a distance of 64,400 km (40,000 mi) from its centre, in a near-circular, near-equatorial orbit. Juno Large MAIN-BELT ASTEROID discovered in 1804; number 3. Juno is about 268 km (167 mi) in diameter. Despite its early discovery, there are seven main-belt asteroids larger than Juno. Jupiter Largest planet in the Solar System; it is 318 times as massive as the Earth and revolves about the Sun in an orbit with an average radius of 5.203 AU. The orbital period is 11.86 years. At opposition, when Jupiter appears on the observer's meridian at midnight, it subtends a diameter of about 47". Earth-based observers' ability to resolve the disk allowed the polar and equatorial radii to be established at an early date and, using the mass derived from Newton's law of gravity, the average density was determined. A volume equal to 1335 times that of the Earth and an average density of 1.31 g/cm3, less than one-fourth that of the Earth, indicated that internally Jupiter was not earthlike. 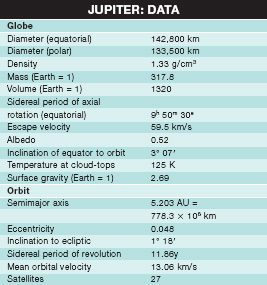 Jupiter is markedly oblate, with equatorial diameter 142,800 km (88,800 mi) and polar diameter 133,500 km (83,000 mi). Jupiter A view of Jupiter, assembled from four images obtained by the Cassini spacecraft on 2000 December 7. The smallest features visible are about 144 km (89 mi) across. The Great Red Spot is seen at lower right, while the shadow of the satellite Europa is a dark spot at lower left. Early spectroscopic studies revealed that Jupiter's spectrum was highly similar to that of the Sun. In 1932, however, Rupert Wildt (1905-76) identified absorption features of methane and ammonia in its spectrum. Multi-atom molecules dissociate at high temperatures, so this discovery indicated that the observed spectrum was reflected sunlight from a cool planet with a molecular atmosphere. 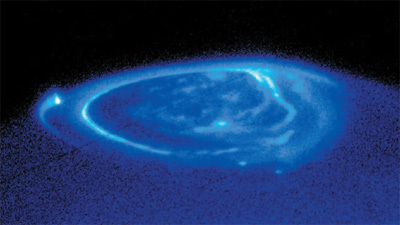 Hydrogen molecules and helium atoms do not possess readily observable absorption features in visible light; with access to infrared data, however, it has been ascertained that the composition of Jupiter, with respect to the relative abundance of hydrogen, helium, carbon and nitrogen, is solarlike. Because Jupiter revolves at an average distance from the Sun of 5.2 AU, the effective solar heating per unit area is reduced by a factor of 0.037 relative to the Earth. Utilizing the data from the PIONEER and VOYAGER missions, the total light scattered in all directions by the planet can be accurately determined; thus, the total absorbed energy is known. When this is compared to the non-solar infrared component of Jupiter's radiation, the ratio of emitted to absorbed solar radiation is 1.668 ± 0.085; that is, Jupiter emits 1.668 times as much heat as it receives. Hence, heat generated internally from decay of unstable isotopes or slow gravitational contraction enters the atmosphere from the interior of the planet. Even with its internal heat source, the outer regions of Jupiter's atmosphere are extremely cold, with the cloud-deck temperature near 150 K. The visible cloud deck occurs at a depth of about one bar of pressure and is composed mainly of ammonia ice. Beneath this deck temperatures and pressures increase inwards. At a depth of 5-10 bars the water cloud cycle should occur, moving energy from the deeper regions by convection and condensing and releasing the energy at higher levels. At still deeper levels the gaseous atmosphere becomes a liquid ocean, which eventually changes into a region composed chiefly of hydrogen and helium. Under the large pressures due to gravitational force on the overburden, this region exhibits a crystalline structure and is a good conductor of heat. It is referred to as the 'metallic hydrogen' core. At the centre of the planet is thought to be a dense central core of about 15 Earth masses, comprising the heavy elements, which have migrated inwards. Results from the GALILEO orbital mission have improved our knowledge of the Jovian system dramatically. The first detection of radio emissions from Jupiter was made in 1955 by B.F Burke and K.L. Franklin. These emissions are concentrated in wavelengths of tens of metres (called decametric) and tenths of metres (deci-metric). The decametric emission is caused by electrical discharges along the Jovian field lines when IO crosses them. The rotation rate of the observed radio signal, presumed to be associated with the rotation of the conductive core, is approximately 9h 55m.5. Based on this data, a standard rotating co-ordinate system, SYSTEM III, has been selected by the International Astronomical Union (IAU). The zero longitude has been chosen, corresponding to the central meridian of the planet at 0h UT on 1965 January 1. Longitude has been defined to increase with time at a rate of 870°.536 per 24 hours. Within this system, the latitude and longitude of small eddies within the cloud deck can be measured as a function of time; thus the prevailing winds can be derived. These measurements are interpreted as atmospheric motions relative to the interior of the planet, and, if fully understood, they could reveal a great deal about energy transport within the planet. Jupiter An ultraviolet image of Jupiter’s north polar region, showing auroral activity in 1998 November. Bright spots in the auroral oval mark out magnetic ‘footpoints’ connected to the satellites Io, Ganymede and Europa. 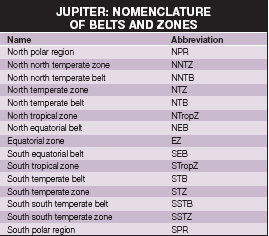 Average zonal winds are characterized by strong eastwards winds within 10° of the equator and a series of alternating westwards and eastwards jets extending towards the poles. At latitudes equatorwards of 40°, bright zones are bounded on the equatorwards side by a westwards jet and on the polewards side by an eastwards jet. These regions have anticyclonic flow and are equivalent to upwelling regions in the Earth's atmosphere. The brown intervening belts have cyclonic shear and, by analogy, should be regions of downwards flow where ammonia ice melts. Detailed photometric studies indicate that there is an aerosol haze extending from high altitudes to below the cloud deck. This haze contributes a yellowish-brown coloration to the planet. The size of the particles and the depth to which the line-of-sight penetrates play a large role in determining the hue and shade of a specific cloud feature. The number of times the reflected photons have been scattered off particles and the amount of ammonia ice located at high elevations both play a role in the observed ALBEDO. Individual cloud features within the Jovian atmosphere are large and long-lived. A low effective temperature causes Jupiter to lose the excess energy that is brought up by convection cells more slowly than does the Earth's atmosphere; however, this does not explain the extreme longevity of some cloud systems. The most well-known feature is the GREAT RED SPOT, centred at about 22°S. Nested between a westwards wind along the northern edge and an eastwards wind on the south, this giant elliptical cloud system rotates in a counter-clockwise, or anticyclonic, sense. To a large extent, the visibility of the Great Red Spot is determined by the amount of turbulence present in the westwards jet deflected around its northern perimeter. White eddies enter the feature during periods of active convection, rendering the contrast so low that detection is difficult. Actually, the Great Red Spot reflects no more red light than do the surrounding white clouds. Its uniqueness lies in the fact that the circulation of the feature brings to the surface some unknown constituent that is a strong ultraviolet and violet absorber; hence observing through a broad-band violet haze filter enhances the visibility of the feature. Small red spots, displaying the same ultraviolet absorber, appear at a similar latitude in the northern hemisphere: however, they do not grow to over-fill their windspace and become long-lived features. Many models have been proposed to explain the long-lived well-defined cloud features. These models deal with stable wave solutions and energy and momentum transport. Direct sampling of the Jovian atmosphere by the entry probe released from Galileo in 1995 December allowed measurements of its composition to be made to an accuracy better than one percent. Hydrogen and helium are present in essentially solar proportions, along with molecular species including CH4, NH3 and H2S. These molecular species, together with S2 and various metals, were dredged up from depth by the SHOEMAKER-LEVY 9 impacts in 1994 July. A ring system was discovered during the 1979 VOYAGER 1 encounter, with the brightest component, comprising micrometre-sized particles lying in the equatorial plane, being 7000 km (4000 mi) wide, and located 129,000 km (80,000 mi) from the planet's centre. Jupiter's magnetic field is similar to that of the Earth. To a first order of approximation, it can be represented as a tilted dipole that is 10 times stronger than the Earth's field. Deviations from a dipole shape and failure of the magnetic axis to be aligned with the rotation axis or to pass through the centre of mass indicate that complex structure may occur deep in the interior. Interaction of the magnetic field with the SOLAR WIND causes particles to decelerate and become entrapped in the magnetic field, creating a complex region around the planet, the MAGNETOSPHERE. The high velocities of the entrapped particles create a hazard for exploring spacecraft, because high-speed electrons, protons and alpha particles can penetrate the craft and cause electronic or radiation damage. The shape of the magnetic field has been sampled only near the equatorial plane by the Pioneer, Voyager and Galileo spacecraft. Advance planning for a Jovian polar orbiter has begun. Jupiter A set of images showing Jupiter’s small inner moons as seen from the Galileo orbiter in 1996/7. These are shown at their correct relative sizes: (left to right) Thebe, Amalthea, Adrastea and Metis. 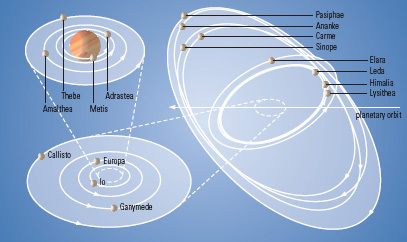 The accompanying diagram shows the scale of Jupiter’s extensive satellite system. Many of the more distant satellites are probably captured asteroids or comet nuclei. Ongoing research to obtain a model that is self-consistent involves several major regions of the planet. Within the deep core, problems concerning the nature of the contaminated hydrogen-helium alloy and the manner in which it conducts heat outwards are challenging. How this region interfaces with a convective envelope, and the degree to which the rapid rotation introduces an organized cylindrical circulation about the axis of rotation within the envelope, is under investigation. The manner in which the envelope couples with the atmosphere, and the degree to which the dynamics of the atmosphere is driven from below, are an area of active research and controversy. As we continue to explore the Solar System, comparison of Jupiter with the other gas giants - Saturn, Uranus and Neptune - will enhance our understanding of this giant planet.